“Move aside, you fools,” Nigel shouted. Diana jolted awake. A cacophony of shouts and neighs sounded just outside the coach, made by what must be an inordinate amount of horses and men calling their greetings to one another. The coach had stopped, presumably in the ostlers’ yard at the Maiden’s Crown, but the racketing around by jingling harnesses and stomping hooves did not call to mind the exclusive inn’s normally quiet order. Diana told Selby and Margaret to remain where they were while she investigated. As soon as she stepped outside, it seemed as though she were the only female left on earth amid males of every description from country yokels to London dandies. Nigel had all six sets of reins bunched in one fist while directing the Northam outriders to hold the excited team. Selby and Margaret alighted, the former fixing an icy stare on one unfortunate who gaped at them with a straw hanging out of his mouth. At the dresser’s glare, the man took himself off. She thought briefly of Griffin. If he were here, it would be his province to deal with travelling upsets. But as he was not, she would. God knows she had enough experience. She briefly wondered if he might have stopped to watch the boxing match, leaving his horses with some boy to look after for a guinea. Men liked that sort of thing, the blood and violence of a good fistfight. They also liked to ride their horses or curricles on the open road, without female companionship. Poor Diana, my heroine in Notorious Match, had run smack-dab into the middle of a sport that was all the rage in the Regency. Called the “sweet science” by noted sportswriter Pierce Egan, pugilism seemed a Godsend to males everywhere in the early nineteenth century. . The Jane Austen Centre does a lovely overview of the sport as it is confined to the early eighteenth century, including a nice excerpt from the movie Becoming Jane. More specifically, pugilism, along with men’s only clubs, are examples of male homosociality during the Regency. Homosociality. Like the more recent term bromance. A distinction, mind you, from those relationships that are of a romantic, or sexual nature. One of the things my heroine wrestles with is the prodigious desire on the part of men to socialize with other men. Why should it matter that men do things together? Because Diana was curious. As am I. 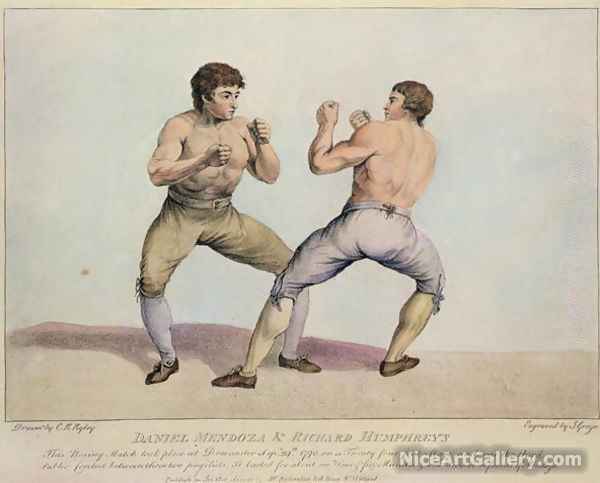 This entry was posted in Notorious Match, Regency, Uncategorized and tagged boxing, Gentleman Jackson, pugilism by Angelyn. Bookmark the permalink. This reminds me of the time Lucy (I love Lucy) dressed as a man to go to the ‘baby shower’ Ricky was having. She wanted to see what goes on in the men’s circle. Somehow, I don’t think men are too interested in what goes on in women’s gatherings. In this and age they would be shocked. OH! I’ve seen that episode—too funny. It’s amazing the insight that comedy provided on the relationships between people. Like the bromance between Fred and Ricky. I think they watched a boxing match together on tv, didn’t they?